Jamaica. A place that is known for a lot of things and still, people who have never been there might in fact not know anything about this lovely Caribbean island. So I never expected the island to be so different: we landed in Kingston and then drove to Port Antonio where we stayed in the jungle before moving to one of the chicest beachside resorts in the world at a the place that's more US than Jamaica: Montego Bay. 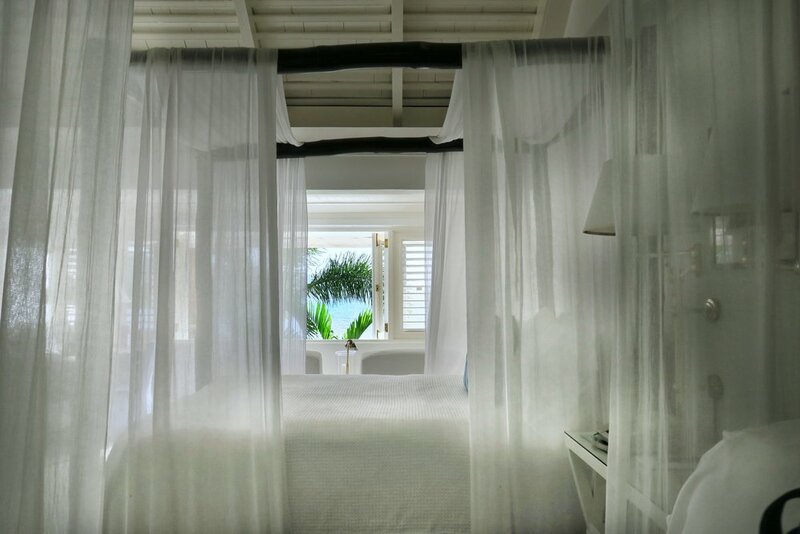 Designed by no one else than Mr Ralph Lauren himself, Round Hill Resort is the definition of high end Caribbean beach vacation. I don't know if it's because I am hopping the Caribbean islands or it's the sea, however Caribbean resorts tend to be very close to perfection from my point of view. Upon driving down the driveway, along the privately owned villas, you can spot a chic small building that makes up the main part of the resort where the front desk and concierge are located. The car stopped, two bellmen arrived and welcomed us before we headed towards the front desk. Melissa was checking us in and explained all details about the resort. Soon afterwards we were walking to the Pineapple house where the Oceanview Rooms are located. You can either get a room on the ground floor with limited sea view but with a terrace or a room on the first floor with unparalleled sea view but no outdoor seating possibilities. Our room - number 126 - was located on the first floor and one could immediately register: this must have been designered by a famous designer. Everything is colored in white, beside the cushions and the wooden four poster bed - it always gives the room such a light and clean feeling. Some might find it a little bit too sterile but how can it be more perfect for a seaside resort? It's like taking the ocean into the room when the blue shimmers through the vast open windows. Our lovely room had two queen beds with extremely comfortable mattresses, a wardrobe, two chairs facing the windows, a writing desk with navy-striped chair (so Ralph Lauren style), a minibar which actually was empty as well as a iPhone Docking Station to listen to music and charge the phone. Next to the bedroom was the spacious and sunny bathroom with chic double vanity desk, bathtub, toilet and walk-in shower. Everything was well maintained, there were two towels per person and the hotel branded toiletries with Pineapple smell fit perfectly to the atmosphere. After the housekeeping service on our second day, they brought another set of toiletries even tough we did not finish them which is a great plus for me. I also appreciated that the hotel provides mosquito repellents and Aloe Vera gels for the sunkissed ones :). In the unlikely event of yourself having enough of the kiddies, there is a secluded area reserved for adults only. While it's quite a walk of 5 minutes, once you reach the spa area you immediately forget about the workout you just did. Next to the spa pavillon there is a small pool, a big field with sun beds and plenty of privacy as well as the vast fitness pavillon. All the equipment was very good and they provide everything that's needed for a vacation workout. Unfortunately we didn't use the spa, which however would have been a wonderful idea - but I need a reason to come back one day. Although we had a meal plan including full board and drinks by the glass, we headed to the Ralph Lauren Lounge for the complimentary Afternoon Tea served from 4 to 5pm - after our workout of course. During this time you can make yourself a cup of tea while savouring finest finger food such as egg-, cheese or cucumber sandwich, delicious pastries including amazing brownies, Jamaican jerked popcorn or try one of their scones. It's a really nice add-on and a great way to get appetite for the main highlight: the dinner. Once we took a shower and dressed up for dinner my colleague Lukas and me were impressed of the beautiful dinner setup on the Sunset terrace - there were light chains all over the terrace and the tables were put around the main square where the live music was playing. It couldn't have been any better ambiance. Soon we received the menu and ordered shrimp cocktail as a starter before having lobster tails in a wonderfully fresh sauce. While my colleague is not that sweet, he fell in love with their amazing desserts: banana ice cream and roasted bananas while I went for the delicious apple cake - I am still dreaming of it. Following a good night's sleep, we were ready for breakfast which is served in the Grill restaurant above the Ralph Lauren Lounge. Service was always super friendly and the quality of food flawless. We ordered omelettes and pancakes while the had salmon, Yoghurt, fresh fruits and orange juice on the buffet. You always need to sign for breakfast for account purposes which is a little bit unnecessary considering that as a resort it is included anyways. After breakfast we signed up for their complimentary glass bottom boat tour starting at 9.30 am every day in front of the water sports building. In these 30 minutes you get to see the house reef in front of the hotel as well as the reconstruction of the corals arranged by the hotel. Such a stunning amenity. We said ourselves that it's now time for a bit of beach time and before we could even enjoy it enough, the sun set again and we went to the Infinity Pool bar for some sunset cocktails. It gives you the most amazing holiday feeling when you are lying on your beach chair, a cocktail in one hand and the only thing you need to do is enjoying the sun setting on the horizon, somewhere over where Cuba starts. That evening they set up for a Caribbean Barbecue Night which is still the main highlight of our seven weeks trip up to now (Hello from the Bahamas - 4 more weeks to go). All tables were located on the beach actually and while some mean by the beach, we were all seated on the beach with real sand underneath our feet. So it was a nearly perfect evening, however the peak of the entire stay was the music that played along with the Barbecue night. It felt like in the most Hollywood-like movie of a tropical island seating there, getting surf and turf with lobster and black agnus fillet while the most tropical music was playing. We just missed Adam Sandler and Jennifer Aniston playing a couple (Haha). If I could sum up the stay in three words it would be: My tropical favorite! I totall fell in love with the Ralph Lauren style of the hotel and I still have a hard time thinking of the place but not being able to be there. Plus all staff members did their best to offer an amazing service, the rooms are comfortable and chic, the bathrooms exactely my taste and they even have great toiletries. I don't need anything else but as always this luxury comes with a price tag. We were guests of the Round Hill Resort and would like to thank Exclusive & Different for arranging this gorgeous stay. All above written expresses our own opinion and has not been influenced.